As is usual when I go from East Coast to West Coast, I woke up insanely early compared to local time. It allowed me to head out to the strip for a good walk to check out all the changes that have happened since the last time I was here without a crush of people and without having to deal with people handing out stripper cards. Back in the room, I tried to log into my EHR to check messages and see if there were any charts from mid-level providers that needed signing, only to find that the system is down. I’m sure they’re having heart failure at the office since we’re still in the throes of flu season. 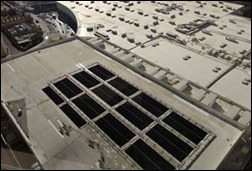 My hotel room has a lovely view of the roof of the expo center and I was glad to see some solar panels as well. After my usual HIMSS breakfast of a Clif Bar and Diet Coke, it was off to sessions. I hate fighting the coffee and breakfast lines at most conferences and HIMSS is always the worst. I’ve learned to bring my snack stash and especially so for this conference, since there won’t be any MedData scones. I waited until the expo hall opened and it was still gridlocked when I headed down the escalator from the faux St. Mark’s square. Claustrophobic people should not attend HIMSS since the aisles were packed today, even in Hall G. I did spend a fair amount of time there today, mostly because the vendors were more enthusiastic and actually acted like they wanted to talk to you rather than seeing you as a distraction from their internal conversations. Not every vendor was avoiding customers, however. I had some issues with vendors upstairs being overly aggressive, straying way outside their booth boundaries and actually stepping in front of attendees and blocking their way to try to talk to them. There were also lots of people shooting video in the aisles, even up on ladders taking pictures of their booth, which didn’t help the crowding. 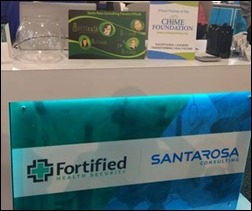 Cheers to sponsors that had their signs out front and center: Aprima, Dr. First, Elsevier, Forward Health Group, Health Catalyst, and Fortified Health Solutions / Santa Rosa Consulting. Jeers to Imprivata’s scrub-clad demo team, members of which were also wearing lab coats. No one is fooled by the fact that you’re not actual clinicians. I was surprised to see how many people were watching their demo. I had a great chat about Office 365 with this gent from Tech Data, who humored me with a photo of his cloud suit. He promises a shorts version for next year in Orlando. There’s so much going on at HIMSS that you really have to have something to grab attendee attention – I’m not sure the “same old, same old” attention-grabbers in the booths such as golf swing analyzers and cheap giveaways are cutting it. NextGen showed off in Booth 3821 with a four-panel screen printing machine making tote bags on demand – for every bag given away, they’re donating food to needy youth. In Touch Health had a soft serve bar, but they’re located in a far corner of the hall. I only ran across it because I was turned around and couldn’t figure out how to get out of the hall. Juniper Networks had their oversized Operation game. MedData had a vintage candy shop complete with Wax Lips, which I haven’t seen for decades. Kudos to them for finding something to (hopefully temporarily) replace the scones we all love. Edifecs had some super cute pink shoes on display as part of their #WhatIRun campaign. I found these folks painting away in Hall G, in a mostly-anatomically correct way. You never know what you’re going to see at HIMSS, and so far, this is the weirdest thing. 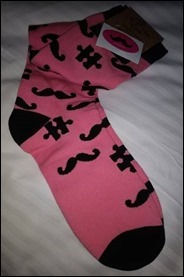 I was gifted with some pink socks today and must say I am thrilled! Towards the end of the afternoon, I ran into an old friend outside the Logicalis Healthcare Solutions booth in Hall G. We were chatting away and they were kind enough to let a couple of weary travelers enjoy their comfy chairs late in the day. We talked about marketing campaigns and sales tactics with one of their client executives, who was gracious and engaging. They seem to have a lot to offer, so stop by and check them out. From there it was off to visit various booths for cocktails and then head to the Holon Solutions reception at the Venetian. I was excited to learn about their success at Banner Health, surfacing gaps in care within the EHR. I joined some old friends for dinner, and by the end, my feet were giving out, It’s going to be a relatively early night for me.